Dr. Canapp and assistant assessing a patient. Hauser: Dr. Canapp, as many of our readers know, another name for Prolotherapy is regenerative injection therapy. Could you tell us how you ended up getting interested in regenerative stem cell therapy? Canapp: I came across it in two different fashions. The first was through a company years ago called Vet-Stem in California. It was really for the small animal practitioners, really the first available treatment or source that we had. They were using an adipose derived regenerative cell, basically fractionated. So, you would essentially collect tissue fat from the dog and would ship it to the company in California. They would process it within 24 to 48 hours, they would ship it back, and you would inject it. Years ago it was initially indicated for the treatment of osteoarthritis. Most of the veterinarians, including myself, and the veterinary specialists around the country that were originally using this product, were using it through the Vet-Stem company for the treatment of osteoarthritis. It did have two peer-reviewed journal articles. Both were in the Journal of Veterinary Therapeutics. One was for the treatment of osteoarthritis in the elbow; one was for the treatment of osteoarthritis in the hip in dogs and showed a significant improvement in those dogs using gait analysis, validating client surveys and so forth, as far as outcomes. So, really that’s where it all began in dogs, but they had been using it in horses for years before we even started using it for dogs. So, how we came across it was through supply and demand. The Vet-Stem Company was doing a lot of marketing in all sorts of magazines and on T.V. Because our practice is very unique, many people find us on the internet and find us through word of mouth all around the country. In fact, just yesterday we did a stem cell case in San Francisco, that flew in, treated the dog, and they flew back out today. So, originally we were into Vet-Stem products because really that was the only thing available for dogs the last good three or so years. Another large aspect of our practice is working with working dogs. Field dogs, agility, search and rescue, Secret Service, CIA and TSA dogs often come to us. Two of the members of the Marion duPont Scott Equine Regenerative Medicine team, who are an equine center very well known in northern Virginia, they have been doing stem cells for years, as well as PRP and other treatments, in horses. One day we were doing arthroscopic surgery on one of their search and rescue dogs for elbow osteoarthritis. The surgeon team specialist said, “This would be a good chance for stem cell therapy” and I said, “Yeah, we did consider collecting for Vet-stem.” She said “Vet-Stem, no, we want to do it ourselves.” I said, “Do it yourself?” He said, “Yes, we have an entire regenerative medicine lab at Marion duPont. We have been doing it for years and we don’t use fractionated cells. We actually culture our cells.” She also asked what I was doing for soft tissue injury. She said for tendon and ligament injury, other than physical therapy or surgery that it is something they use very commonly in horses and in humans of course, as well as looking at PRP and other types of regenerative treatments. So, my eyes were opened, and this was about two years ago, by the equine surgeons who have a PhD in regenerative medicine and biological engineering. So, about two years ago we set into this clinical trial, a large randomized placebo control type of double blinded trial where we were working with the people from Marion duPont. We were looking at the use of regenerative medicine for soft tissue injuries, so we started getting a little away from the treatment of osteoarthritis and much more into the realm of soft tissue injury, like they were using it for in horses and what looks to becoming so much common place in humans as well. So, that’s sort of how we became involved early on through the Vet-Stem Company. (The use of stem cell therapy) for soft tissue injury really was by education through the regenerative medicine scientists at Marion duPont. Hauser: Regarding terminology like PRP and stem cells, can you explain to our readers the differences of how you might use them as they relate to your veterinary medicine practice? Canapp: Absolutely, when we say stem cells it is almost a bit of misnomer, i.e. it is not the way the public understands stem cells. This is not embryonic stem cell therapy. This is using stem cells from adult tissue from that patient. So, we can take lots of different cell types or tissue types which have these mesenchymal cells in them, and what we mean by that is within the tissues in an adult’s body are these small cells that have the ability to differentiate into many different cell lines, and we call these mesenchymal cells. For instance, you can take bone marrow, periosteum, or the lining of bone; you can take fat or adipose tissue. Early on it was thought we had to use bone marrow but since that time we found that adipose tissue, or fat tissue, does have the ability to differentiate, meaning to turn into cells such as bone, tendon, ligament, cartilage, and other types of tissue. In the veterinary field, as far as small animals, we tend to reach for fat cells or adipose-derived cells because it is less painful than going after a periosteum or bone marrow. We can obtain a much larger yield. Trying to get enough periosteum or bone marrow in a small cat or dog can be very challenging, whereas lots of dogs have love handles or excess fat stored that we can obtain stem cells from. It’s fairly cosmetic. We can make a very small incision to obtain those fat samples and because we are culturing out cells we do not need a very large quantity. So, very small sample of fat can yield four to five million regenerative cells that we’ll be injecting. So, when we say “stem cells” that’s really more for the layman’s terms so they understand that. Truly the therapy we are using in that regard is adipose derived progenitor cells or ADPC. PRP, on the other hand, is something where we are actually taking blood from the dogs and getting into the technology being given to people and horses. The blood sample collected from that patient contains platelets, the cells that help to clot when there is damage or an injury. Inside those cells are very active growth factors, proteins, all sorts of good substances that can help speed up the healing of tissues, cartilage, new blood supply, and it is shown now to help regenerate tissues. So, you get the best of both worlds if you combine them and this is something that is very new. By combining ADPC with PRP you get cells for regeneration, growth factors, and scaffolding to provide a template for cell attachment. We are the only group that I am aware of, so far in the United States that is actually combining (these treatments), although I don’t know for sure; the use of stem cell adipose derived regenerative cells with PRP and we are using both of them together for injury in our canine patients. Hauser: Yes, that was a great explanation, which leads into my next question. Are you using a similar mix for joint problems or osteoarthritis problems, as well as soft tissue injuries, like ligament and tendon injuries? Canapp: That’s a great question, and in regard to that, we are not. What we are doing for osteoarthritis treatment is using adipose derived progenitor cells (ADPC) with autologous conditioned serum (ACS). We don’t want the actual platelets in the joint because that can lead to fibrin formations. Fibrin in the joint is not necessarily the best thing according to the Marion duPont equine regenerative medicine team. They do, however, want all the good substances that are in the platelets. So, they make the platelets release all the good stuff (growth factors, bioactive proteins etc.) to collect the ACS. So, if we are injecting individuals for osteoarthritis we are using a combination of ADPC mixed with ACS and that goes intraarticularly into that patient’s joint. If we’re looking at soft tissue injury, and for that we are talking tendon or ligament injury, then we are using the PRP directly because the thought is that we want a scaffold. When you inject stem cells into a tendon or a ligament, they really do not want to be there. They are naked in an environment they are not used to, and they really just want to shed and go with the bloodstream and basically leave the premise from where you injected them. What the theory is, and what we are seeing so far is, if we inject them with PRP, PRP acts as a nice scaffold. It’s almost like a blanket of security for these stem cells so they have something to attach to and then they can go into the process of regeneration. So, for soft tissue injury outside of the joint, we use the PRP with the stem cells because that does give a scaffold for these tissues to heal. Hauser: Can you give us some idea of the kinds of conditions that would respond to these types of stem cell treatments? Canapp: Absolutely. Early on when we were starting to work with regenerative medicine, we were using it primarily just for the treatment of osteoarthritis and that’s what it was initially indicated for. That could be anything from a patient that had an early ACL injury and now has subsequent osteoarthritis in the knee, to a patient that has osteoarthritis in the elbow, ankle, or hip, or pretty much any joint. So what we were reaching for initially was just the stem cells fractionated and injected. Since that time, now we are using the ACS with the ADPC that are cultured. So, we’re using that for acute cases of osteoarthritis or even the most severe chronic cases of osteoarthritis. In our initial trials, what was a little disheartening to me was that we were seeing a phenomenal response in clinical outcome. When we were evaluating these dogs objectively using objective gait analysis we were truly seeing that these dogs were bearing more weight on the affected limb, they were improving in their eating, walking, trotting, and stride length. All of these objective variables were improved. Range of motion using geometric measurements, even limb circumference over time was improved, because they are using the limbs better so the muscle mass was improving. However, on second look arthroscopy, when we would go in the second time arthroscopically to evaluate the joints, what I was very surprised to see was there was no new indication of cartilage formation. In other words, in that arthritic elbow, for instance, there was as much osteoarthritic change that we could see with the scope as there was at the initial time of the scope. However, the joint looked much healthier as far as the inflammation. There was much synovitis, or joint capsule inflammation. So, based on that, what we find clinically is if you use stem cell therapy or regenerative medicine for the treatment of osteoarthritis, we tell our clients that what we found long term is that it would last for about nine to twelve months clinically, and then it would start to wear off. The dogs would start to show signs of fitness lament and starting to head back where they were prior to treatment. That’s not a problem because we banked our cells. So, the stem cells are banked back at the lab, and I would call up Marion duPont and say, “Go ahead and recall for these cells. Go out and process them, culture them out, expand them.” We would then bring the dog back in and inject again with the ACS and ADPC. So, we found that with dogs’ osteoarthritis, pretty much moderate to severe cases for the most part, we were able to be out for about roughly nine months plus or minus, and then would require a second injection. Hauser: As it relates to PRP, when you treat a tendon or a ligament injury, are there certain injuries that respond better? Is it the same sort of process where you treat the animal one time or are you treating two treatments in a row? Canapp: Absolutely. In particular, for our clinical cases, in our large clinical trial the ones of the shoulder are primarily what are called the subscapularis tendon, the supraspinatus tendon, and the biceps tendon. So those are three common structures we are treating with the PRP and stem cell therapy combination. There is a very common injury in some dogs where they get a carpal hyperextension injury, where they jump down off of an SUV, or off of a high deck in the back yard and they land on that wrist and that wrist starts to break down and they get a flexor tendon strain. We are using that combination therapy for that as well and are getting very good results. We have had patients with very early ACL injury using a combination of cultured stem cell with PRP for regeneration of the ACL. But it has to be a very early partial tear, less than 25 percent, of an ACL of what we call the craniomedial band has to show signs of breakdown. The rest has to be completely healthy. In the hind limb, in the Achilles tendon injury, with the combination of PRP stem cell therapy, I have been very pleased with the response. As far as PRP alone, we can use it for the treatment of osteoarthritis. Again, we’re going to use ACS from the platelets instead of PRP directly. We’ll use the conditioned platelets to inject so we don’t get fibrin in the joint, and we do have to inject multiple times. So, unlike using stem cells with PRP we seem to get a longer response for arthritis than if we do it with PRP alone. They will have to come back for a second or third injection over time to get a response. The same is true with soft tissue injury. We get a much better long term resolution with the combination of PRP with adipose derived regenerative cells than we do with PRP alone. We found with PRP so far, for tendon injury in particular, we will have to go and inject them a couple times. In fact, up to two or three times with PRP to get the same success that we would get with one injection of ADPC in addition to the PRP combo. Hauser: Sherman, you’re an orthopedic surgeon. If an animal doesn’t need surgery, meaning there is not a complete tear, is there a certain protocol that you would have them do as far as rehabilitation, or do you just have them resume their normal activities? Also, when do you use splinting? Canapp: Even though I am an orthopedic surgeon on the veterinary side, I’m also boarded in sports medicine and rehab. I am a big fan of non-surgical treatment and the majority of the clients we are doing are non-surgical. What I mean by that is the lesions that were talking about, the biceps lesion, the supraspinatus lesion, the flexor carpal lesion, and even the Achilles lesion, these are animals with what we call core lesions. In other words, this dog Sophia from Delaware injured her Achilles tendon at the dog park. Sophia didn’t actually rip her Achilles tendon off the bone, nor did she have a full tendon tear. She had a disruption within the mid-body of the superficial digital flexor tendon of that Achilles mechanism, and for that there is not really a surgical treatment. There is not a tissue above or a tissue below that we can suture back together. The only options we have for a situation like that is either physical therapy, which, unfortunately, will lead to some scar tissue formation and the tissue is not going to be as strong and is prone to re-injury and breakdown over time, or these regenerative medicine techniques. I’d say for 90% of these cases we are describing, they are non-surgical treatments. They go straight to regenerative medicine. So, we will do an MRI or a diagnostic musculoskeletal ultrasound to confirm the diagnosis, or in some cases we are doing an arthroscopy if it’s an articular case, to confirm it. We are not treating any of these surgically. We are simply using MRI, ultrasound, or arthroscopy to get the diagnosis and then using these regenerative techniques. Hauser: I saw that on a couple of your cases, for instance the Achilles tendon, there was a rigid custom orthotic used. Canapp: Yes, to explain that situation with these dogs, for instance Sophia, she was a puppy but she was close to 200 pounds. We have to do physical therapy, we have to limit crazy activity, and that can be challenging for a huge puppy mastiff. I have to protect those tissues as they’re healing. We need some kind of mechanical load across that tendon, and we have to control that load and protect it. So, we would use different types of functional braces, functional orthotics, and even types of slings that will allow the animal to walk on the limb and still protect it as those tissues are healing and going through therapy. We are very fortunate that there are three human orthotic and prosthetic companies who, out of the goodness of their hearts, have taken an interest in veterinary medicine and are creating devices. We are using hinged functional knee braces, prosthetics, and orthotics, for dogs just like they would in children or people. We will then cast the leg with measurements and send the cast off. They make these devices for us and send them back for the patient. Hauser: Dr. Canapp, thank you so much. Buyer presented to VOSM with a history of intermittent right forelimb lameness and performance related issues during agility trials. He was non-responsive to non-steroidal anti-inflammatories and rest. At consultation, Buyer had mild muscle atrophy, decreased shoulder extension, and an increased abduction angle of the right shoulder in comparison to the left. Discomfort and spasm was noted on abduction of the right shoulder as well. Radiographs taken at the time of consultation were within normal limits. A gait analysis revealed a decreased step length as well as decreased pressure in the right forelimb at a walk and trot. An arthroscopic evaluation was recommended as it was suspected that Buyer was suffering from a rotator cuff injury. A right shoulder arthroscopy revealed significant pathology consistent with severe medial shoulder syndrome (rotator cuff injury—specifically subscapularis disruption and tearing). 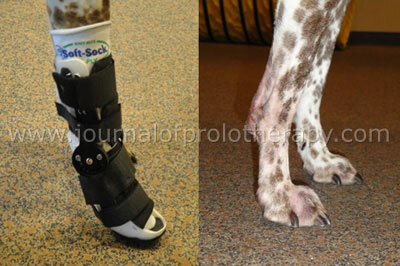 The owners were presented with the option of reconstruction or regenerative medicine therapy to treat the condition. It was elected to move forward with stem cell therapy and fat was collected at the time of arthroscopy. Buyer was then placed in the shoulder support system immediately following surgery. Two days following the arthroscopy an intraarticular adipose derived progenitor cell with autologous conditioned serum (ADPC with ACS) was performed in the right shoulder and Buyer was then enrolled in a controlled rehabilitation therapy program. This program included manual therapy, modalities and therapeutic exercises. Post surgical rechecks were performed at 30 and 60 days. At these rechecks, significant progress was noted on physical exam and gait analysis. Ninety days following surgery, a second look arthroscopy, gait analysis and orthopedic exam were performed to evaluate Buyer’s healing. On physical exam there was no discomfort or spasm on abduction of the right shoulder, no restrictions on shoulder range of motion and improved muscle mass. Gait analysis showed improved pressure and step length in the right forelimb in comparison to the left. The second look arthroscopy 90 days post injection showed complete healing (regeneration) to the compartments of the medial shoulder. By 18 weeks after surgery Buyer was able to gradually return to normal activity and begin retraining to return to agility. At the 6 month recheck there were no scapular restrictions noted and his muscle mass had improved (only a 0.5cm difference was noted between contralateral forelimbs). Buyer’s range of motion was within normal limits in shoulders, elbows and carpi (wrist). One year following surgery, Buyer returned for an evaluation. There was equal forelimb muscle mass and no restriction on range of motion of the shoulder. His abduction angle was normal and no discomfort or spasm was noted on shoulder abduction. The gait analysis revealed equal distribution of pressure and step length between forelimbs at a walk and trot. Sophia presented to VOSM with acute left hindlimb lameness and soft tissue swelling in the distal aspect of the Achilles tendon and proximal calcaneal region after an episode at doggy daycare. She had minimal improvement with rest and non-steroidal anti-inflammatories. Advanced diagnostics were recommended to evaluate the left hock, specifically the Achilles tendon. The MRI performed revealed a disruption of the superficial digital flexor tendon and regenerative medicine (adipose derived progenitor cells with platelet rich plasma (ADPC with PRP)) was recommended. At the time of fat/blood collection, a diagnostic ultrasound was performed to locate the focal area of disruption. Sophia was placed in a lateral splint and a custom rigid orthotic was ordered. Once the cells were available for injection, an ultrasound guided injection was performed into the area of disruption of the Achilles tendon and she was fitted with the custom orthotic. Sophia was then enrolled into a controlled rehabilitation therapy program consisting of manual therapies, modalities and therapeutic exercises. At the 6 week recheck the previously noted swelling around the distal Achilles tendon and calcaneal region was significantly improved. The brace was adjusted to allow for increased range of motion. Diagnostic ultrasounds were performed 30 and 60 days following injection to evaluate healing in the Achilles tendon. The 60 day diagnostic ultrasound exam revealed complete healing of the core lesion (area of disruption). The gait analysis showed equal pressure and step length in both hindlimbs at a walk and trot. At the 16 week recheck Sophia presented with no signs of breakdown in the left Achilles, lameness or swelling and gradual return to activity was permitted. A final recheck was performed 180 days following injection and Sophia presented with no signs of lameness. Her orthopedic exam was within normal limits. 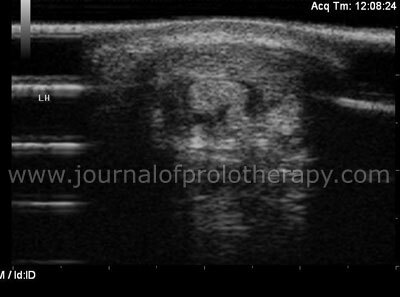 Sophia Initial – Core lesion of the tendon at presentation. Sophia 30 day – Significant reduction in the core lesion size 30 days post injection. 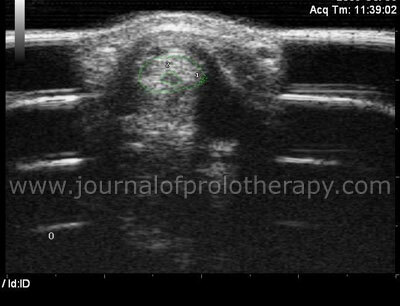 Sophia 60 day – Complete resolution of tendon core lesion. Lakota presented to VOSM with acute right forelimb lameness after running in a field. During the orthopedic evaluation significant soft tissue swelling around the accessory carpal bone and flexor carpi ulnaris tendon was found. Carpal hyperextension was noted as well as a decreased range of motion. Gait analysis revealed a decreased step length and pressure in the right forelimb in comparison to the left. Advanced diagnostics (MRI) revealed a grade II-III flexor carpi ulnaris sprain (core lesion) and regenerative medicine (adipose derived progenitor cells with platelet rich plasma (ADPC with PRP)) was recommended. Fat/blood was collected at the same time Lakota was fitted with a custom carpal brace. Once the cells were available, an ultrasound guided injection was performed into the core lesion. Lakota was then enrolled in a controlled rehabilitation therapy program consisting of manual therapies, modalities and therapeutic exercises. 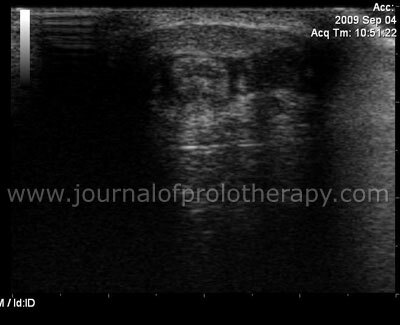 A diagnostic ultrasound exam was performed 8 weeks following the injection. Significant improvement was noted in the area of injection and gait analysis revealed improvement in step length and pressure in the right forelimb. Four months following the injection, an additional diagnostic ultrasound was performed showing continued improvement in the flexor carpi ulnaris. At the same time, gait analysis showed improvement in step length and pressure in the right forelimb and Lakota was allowed gradual return to normal activity. Lakota with swelling and lameness pre-injection. Left: Lakota wearing the support device. Right: Lakota healed after injection. Chevy presented to VOSM with a history of shifting forelimb lameness that was not responsive to rest and non-steroidal anti-inflammatories. Advanced diagnostics were performed prior to traveling to VOSM. These results indicated evidence of severe medial shoulder syndrome (rotator cuff injury) as well as mineralization of the left supraspinatus. At the time of consultation a gait analysis confirmed a shortened stride length and decreased pressure of both forelimbs (worse in the left). Radiographs revealed a large fragment in the left shoulder along with significant osteoarthritis. A bilateral shoulder arthroscopy revealed severe medial shoulder syndrome (rotator cuff injury) and regenerative medicine was recommended for the intraarticular pathology (ADPC with ACS) as well as the supraspinatus tendinopathies (ADPC with PRP). Chevy was placed in a shoulder support system and enrolled in a controlled rehabilitation therapy program. Once the cells were available, ultrasound guided injections were performed in bilateral supraspinatus tendons as well as intraarticular shoulder injections. Chevy was objectively followed with gait analysis at 30, 60 and 90 day rechecks. 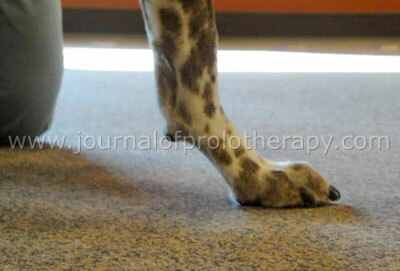 Each analysis indicated continued improvement in the step length and pressure in Chevy’s forelimbs. At 90 days a second look arthroscopy was performed as well. Significant healing was noted to the previous areas of disruption. Chevy returned home to continue his therapy program and is reported to be back competing in field trials with no lameness.